Corned Beef and Cabbage is a popular dish Irish-American eat to celebrate St. Patrick's Day. Corned beef has heavy amounts of fat, saturated fat, cholesterol, and sodium. So keep in mind any dietary restrictions that you or your guests may have when celebrating St. Patrick's Day. Total time 3 to 3 1/2 hours. 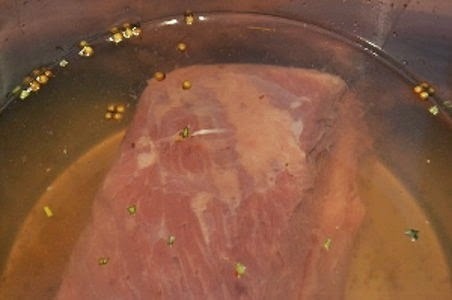 Remove corned beef from package. Trim away as much exterior fat that you are able without compromising the brisket meat. Place the brisket in a large pot with the fattiest side facing down. 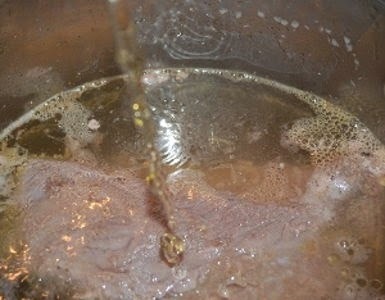 Pour enough water to cover about 2 inches above the top of the corned beef (see photo). Once the water is boiling, add 2 cans of beer (see photo). Cover pot and reduce heat to low. Why add beer to corned beef and cabbage? Because it will help mute the overall briny / salty taste of the dish. Peel and cut carrots. Add carrots to pot. Wash red potatoes and cut into quarters. Leave the skin on to add to the color of the dish. When the first carrot floats to the top of the water, add the potatoes to pot. Remove outer leaves from cabbage. 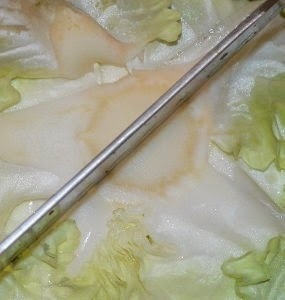 Cut off the bottom of cabbage and wash.
Cut the cabbage in half down the stem (see photo). Cut the halves once again, also down the center line. Add the cabbage quarters to pot. Cut off the top and bottom of the onion. Then cut onion in half down the center (see photo). Peel off dried onion skin. Cut the halves in half once again, also down the center line. 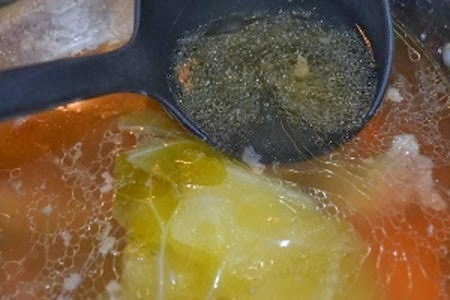 Add onion quarters to pot. The meal is ready once the cabbage, carrots, onions, and potatoes are tender enough to cut with a side of a fork. 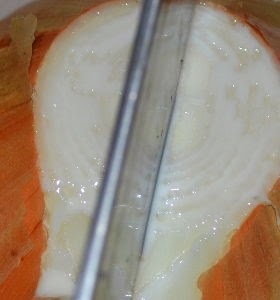 Before serving, use a ladle to skim away as much fat from the top of the broth (see photo). Cut the brisket in thin slices against the muscle grain of the meat to serve.